These programs allow RTP Company to import solid models from other CAD packages for injection molding analysis or structural analysis. RTP Company uses these programs to simulate complex structural problems and determine resulting stresses and deflections. This software allows for a wide range of analyses, from quick simple filling analysis to complex overmolding simulation or anisotropic warpage prediction. This software is used for structural analysis while considering the anisotropic properties of filled materials. This module allows RTP Company to fit test data for our materials, providing the most accurate material models for analysis. RTP Company uses state-of-the-art injection molding analysis software to simulate the injection molding process. Autodesk® Moldflow® Plastic Insight allows us to model complex material properties and molding behaviors in unique material formulations. 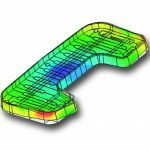 Such analysis can help determine whether a part can be molded with a specific material, what the molding process might look like, and whether any part or tooling design changes might be necessary. RTP Company uses state-of-the-art injection molding analysis software to simulate cooling and shrinkage in injection molded parts. Autodesk® Moldflow® Plastic Insight allows us to model complex material properties and predict how anisotropy, fill pattern, gating, part design, tool design and the molding process might contribute to the ultimate part shape. Warpage analysis can help at any stage in the product development process to help discover things that might contribute to parts being warped or out of round. Warpage simulation can be a great tool for determining the cause of warp in existing tooling. 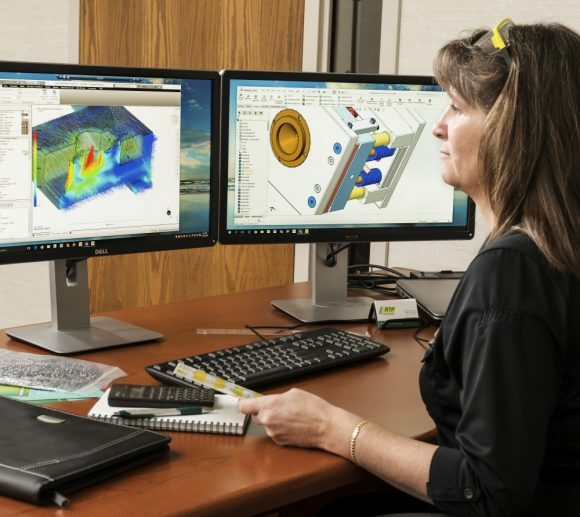 Our CAE Team uses FEMAP and Autodesk® Nastran® FEA software as well as Autodesk® Moldflow® Plastic Insight to review the structural requirements of a part or system in its application. Whether designing for one-time use or for an application in which creep or fatigue could cause failures, structural analysis is often a starting point in determining the strength of the material required and how the tooling needs to be built. One of the biggest challenges in structural analysis for complex fiber reinforced materials is modeling the mechanical properties in a part that is injection molded with an anisotropic material . Moldflow® can be used to review fiber orientation and determine what the mechanical properties will ultimately look like, and FEA can be used to determine the areas of highest stress. This is often an iterative process in which changes to design, material and tooling are all balanced to get an acceptable design. RTP Company can provide guidance and material data for customers doing their own CAE analysis. We have a proprietary company database and can do in-house testing and curve-fitting for both standard and custom materials. Your custom materials data will be processed with RTP Company’s strict confidentiality procedures. If you do not find the RTP material you’re looking for in your injection molding software database, contact us! We have over 400 materials characterized for flow simulation and if your material is not already characterized, we can help you understand the details of how the material will behave and the level of testing required to accurately predict its behavior during molding. RTP Company understands that the better the predictions are from the start, the better the overall project outcomes will be. With that being said, even if a reasonable material model doesn’t exist, we’ll test it for you!